Huge choice of engines, body styles and trim levels is rarely to be found on any car, let alone a premium saloon. The A4 certainly has the user chooser thing licked, though, and the strong resale values and low running costs of the diesels make an even more compelling case. It's just not quite as much fun to drive as the 3 Series. The Audi A4 builds on the same values that its predecessors set before it - excellent build quality, sturdiness and badge appeal. It isn't as much fun to drive as its direct rival, the BMW 3 Series, but does everything else just as well. There's a wide choice of engine and trim options and it enjoys strong resale values. It has since been superseded by more advanced models, but it's still a good all-round premium saloon. The A4 is available in all manner of different guises. It may be best known as a conventional saloon but it's also an estate (Avant), a convertible (Cabriolet) and a high-performance four-door (RS4). That kind of versatility gives it the edge over rivals - there really is something for everyone, especially when you factor in the number of engines and trim levels available. The engines themselves range from a sedate 1.6-litre petrol unit through a raft of economical 2.0- and 3.0-litre TDI diesels, to the powerful 3.2-litre FSI petrol options. Then there's the insanely powerful 4.2-litre V8 of the RS4. Manual, Tiptronic and Multitronic CVT gearboxes are all available depending on which variant you go for. Trim levels start with the entry-level standard model and make their way up through SE, Sport and S Line to the RS4. As is usually the case for premium saloons like the Audi, mid-spec models are the most abundant and generally the best buys. S Line versions are quite sought after as they offer generous equipment and subtle styling upgrades. It's difficult to ignore firstly the availability and secondly the all-round user-friendliness of the 1-9-litre and 2.0-litre TDI models. They're robust, cheap to run and have enough power for most - which is also why they hang onto their value well. There's always the option of more power without much of a dent in the fuel bills, though. 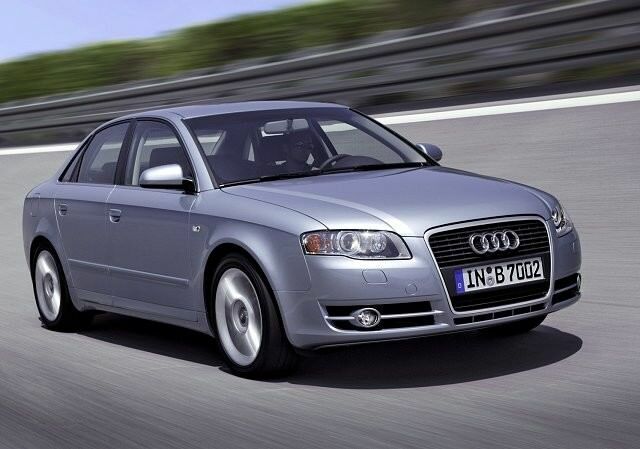 The A4 was also sold with 2.5-, 2.7- and 3.0-litre TDI diesel engines. They're less common, but they're fantastic motorway companions and very punchy. Cars of this age were bought at a time when road tax was calculated according to engine size so there's still a fair few 1.6-litre petrol examples about.